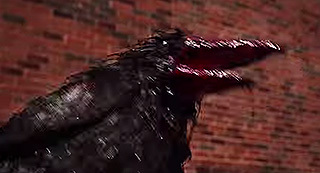 Embedded above is the brief, but exceptionally gory, teaser trailer for the short film Crow Hand!! !, directed by perennial Underground Film Journal favorite Brian Lonano. The film is, from what we gather, yes, about a man who gets a crow for a hand — and disgusting mayhem ensues. Lonano is the master of fantastic lo-fi special effects, and he appears to be returning to the excessive bloodletting of his earlier fun flicks like Attackazoids!. Sweet!